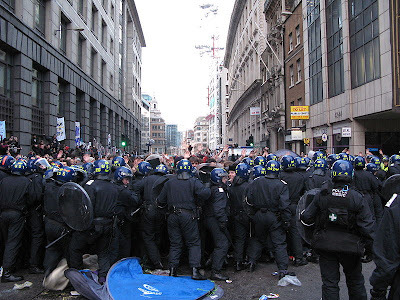 Climate camp protestors who were ‘kettled’ and beaten on Bishopsgate on 1st April 2009 have won the first round of a battle to hold the senior Metropolitan Police officers involved accountable. The judicial review was brought by three people who were caught up in the police brutality on 1st April. Chris Abbott is a researcher and academic who was punched in the face when police officers suddenly surged forward. Hannah McClure is a Masters’ student who was pushed over by an officer who then stood on her stomach. Josh Moos, a Plane Stupid campaigner, who was knocked to the ground as a baton-wielding officer vaulted over him. Mr Abbott’s complaint has been dismissed by the Metropolitan Police on the basis that any officers who may have been involved cannot be identified. 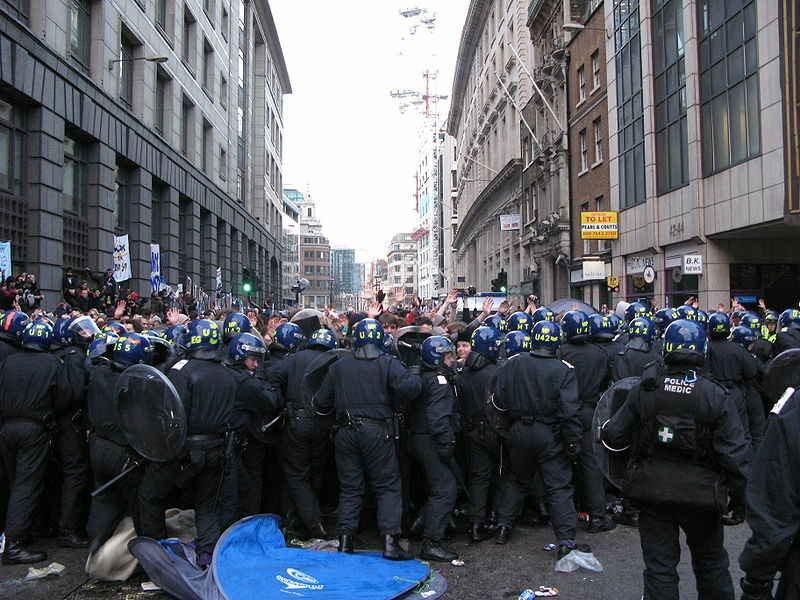 Granting permission for their judicial review to proceed to a full hearing, Administrative Court Lead Judge Sir Andrew Collins commented that the claim involved “issues that can properly be regarded as suitable for the Administrative Court”, including the decision to deploy force which was made minutes after officers had noted a “party like atmosphere” at the demonstration. The judge has ordered a hearing dealing with further disclosure of police evidence early in the New Year. On 12th January 2010 the High Court will also consider Kent Police’s failure to provide evidence relating to stops and searches of 11 year old twins, referred to as girl E and boy T for legal reasons, under section 1 of the Police and Criminal Evidence Act 1984, which requires officers to have reasonable suspicion that an individual is carrying prohibited weapons or articles that could be used for criminal damage. A further hearing involves environmental campaigner David Morris, who was forcibly searched against his will. All were making their way to the Climate Camp protest at Kingsnorth last August. Granting permission for their judicial review to proceed last August, the Divisional Court held that they were appropriately selected test cases for thousands of others routinely searched during the course of the protest.